Volvo Trucks just unveiled one of the most recent innovations in terms of freight transport. It is a fleet of autonomous electric vehicles managed from a distance. These vehicles with surprising design will be making rotations between platforms. With a strong experience in terms of electric vehicles, Volvo Trucks continues its research and innovations about this technology. 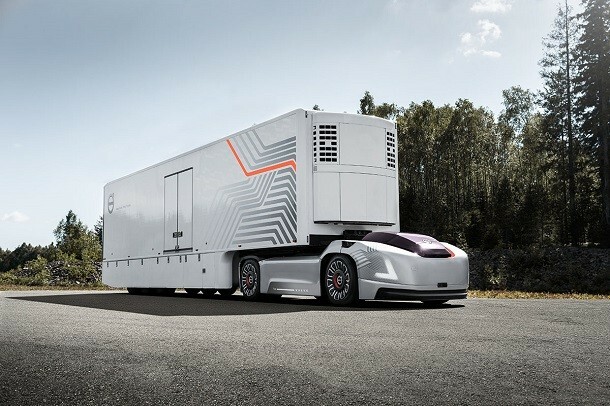 Its new technology foresees different vehicles : cables, 100% electric, completely autonomous and connected, they are made for freight transport. In practice, they will be used as tractor units able to adapt to existing semi-trailers. These trains will be able to be anywhere on the actual road network. The vehicles will be connected by the Cloud to a distance control center, that will overlook their state as well as the state of the freight transported. It also regulates the connected vehicle fleet by adapting the speed of each truck to optimise the deliveries. This new transport mode should bring solutions to freight transporters. Indeed, En effet, they often face a lack of drivers or difficulties delivering in urban areas. These problems are more and more important with the increase importance of online commerce. The 100 % electric vehicles don't pollute or make any noise. They already proved their efficiency in terms of freight transport. With their driving autonomy feature, Volvo Trucks broadcasts them as a new alternative. For now, the developped solutions by the manufacturer are limited to transport between platforms, on short distances and repetitve drive. These vehicles will be used in addition to other solutions.